A number of famous individuals have suffered from sickle cell anemia including Miles Davis, perhaps the most famous jazz musician to have lived (some consider his platinum-selling album Kind of Blue to be THE jazz album), and Tionne ‘T-Boz’ Watkins, a singer and founder of the R&B/hip-hop group TLC. NFL superstar Tiki Barber also has sickle cell anemia and has launched a health education campaign, Be Sickle Smart: Ask Tiki about Iron. Although there is no cure for sickle cell anemia, blood transfusions can be used to treat severe anemia. 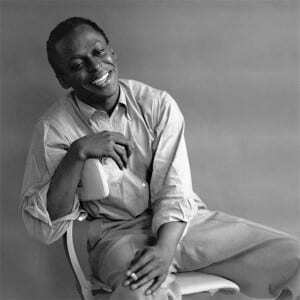 Photo by Tom Palumbo from New York City, USA (Miles Davis) [CC-BY-SA-2.0], via Wikimedia Commons. Sickle cell disease – a group of inherited red blood cell disorders – affects millions of people around the world, but is particularly common among those with ancestry tracing to sub-Saharan Africa. In the United States alone, about 100,000 people have the disease and roughly one in 500 black or African-American babies is born with it. Sickle cell disease is caused by having two mutated copies of the hemoglobin (HBB) gene (one from mom and another from dad). A person with two copies of the S version of the HBB gene (S is short for “sickle”) typically has sickle cell anemia; other versions of HBB are associated with milder forms of anemia. The rates of sickle cell disease are so high because roughly one in 12 Americans with African ancestry carries one mutated copy of the HBB gene and thus has sickle cell trait. People with sickle cell trait typically do not have any symptoms of sickle cell disease, but can pass the disease on to their children – if both parents are carriers (and thus have the trait) there is a 25% chance that their child will develop sickle cell disease, a 50% chance that their child will also be a carrier, and only a 25% chance that their child will not be affected or a carrier. For people planning to have a child, knowing one’s carrier status could be useful information. The mutation underlying sickle cell disease causes red blood cells, which are responsible for delivering oxygen to the tissues, to stiffen and take on a crescent shape that clogs blood vessels. As a result, people with sickle cell anemia have a hard time getting oxygen to certain parts of the body. In the short term this causes excruciating episodes of pain called “crises” and in the long term repeated episodes of reduced blood flow can damage organs. Why would a genetic mutation that causes a harmful disease survive through evolution to the high frequency with which we observe it today? It turns out that people with the S version of the HBB gene are protected against malaria and thus survive better in parts of the world where malaria is common. Over time, having just one S version of HBB – and thus having the sickle cell trait – improved the survival rate in human history so much that this mutation continues to exist in spite of the disease burden it causes. Read more about evolutionary trade-offs in genetics in a previous blog post. February is Black History Month – stay tuned for more posts! Did you know? provides tidbits of information about genetics (both in humans and in other animals) and explains how DNA relates to both ancestry and health.